Living in Wisconsin this time of year everyone is getting their vehicles ready for cold winter weather. Antifreeze is a must in our area. We need antifreeze to keep our vehicles running during the cold winter month. But it is important as pet owners to know the dangers of antifreeze. Did you know that ANTIFREEZE is DEADLY to a DOG? Antifreeze is considered the most common form of poison for dogs & cats. The toxin ethylene glycol is what makes antifreeze so dangerous for both dogs and cats. 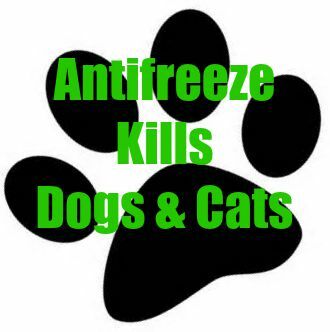 The important thing to remember is that it does not take a lot of antifreeze to KILL your dog or cat. Even licking the antifreeze that drips on the cement or blacktop from a car radiator can cause dead. Less than 3 ounces can KILL a medium size dog.